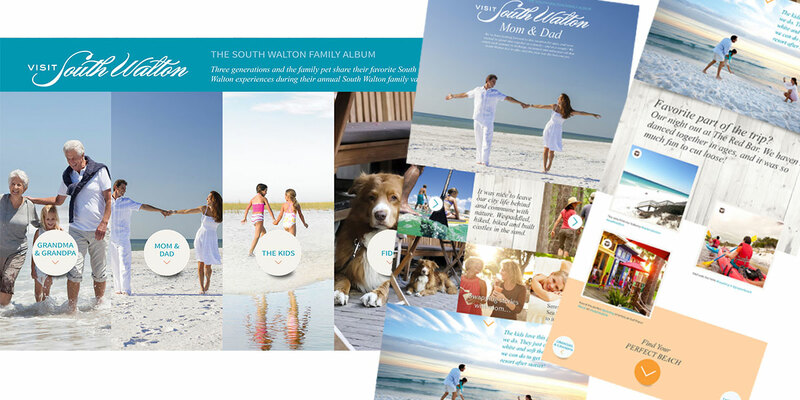 While at Miles Partnership, I worked with the development team to create a new website for South Walton, Florida, a group of beach communities on the Gulf. We sought to immerse the visitor in an experience that felt like being there as much as possible. We used colors from the natural environment, casual fonts that recalled driftwood, and content full of evocative visual references. Each South Walton beach community is unique yet also part of the organized destination as a whole. Our research showed us that most visitors to South Walton stayed in just one beach community. Our stakeholders wanted to encourage exploration of other beaches, while retaining a sense of returning to a favorite vacation spot. While working with existing brand elements we needed to create new aesthetic within that brand to highlight that special sense of place as well as cross-promoting the unique aspects of each community. Our research showed that the typical visitor to South Walton was 50 years old and often traveled with kids. Many were returning visitors. We created a visual story of a family of 3 generations to guide us throughout the project. Since planning a trip often begins long before the trip is taken, we wanted to give the site visitors a sense of returning to their favorite vacation spots, full of memorable experiences. As they go through the site, the visitor clicks the heart icons on pictures they want to save to a pinboard that they can access and share by clicking on My Album from any page. 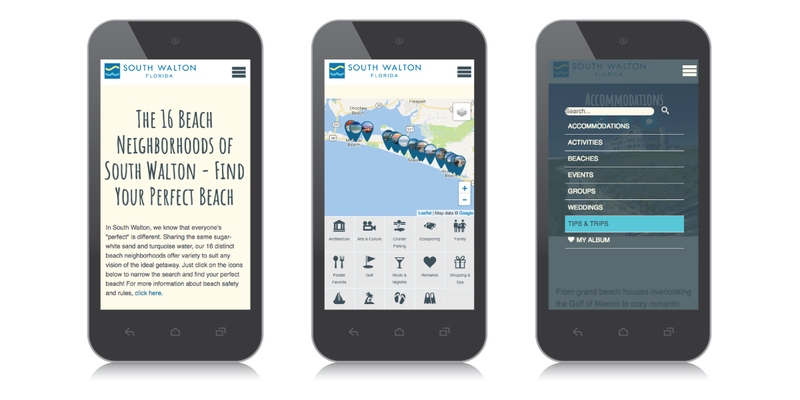 More than 70% of South Walton visitors use mobile phones to make travel decisions during their trips. We blended best-practice patterns with the new brand aesthetic to make the mobile experience easy while maintaining an immersive sense of the area.